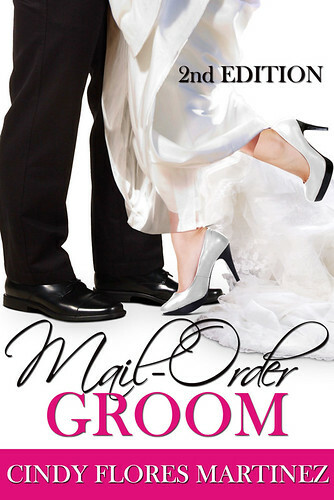 Today is the cover re-reveal for Mail-Order Groom by Cindy Flores Martinez. This cover reveal is organized by Lola’s Blog Tours. There’s something fun about those covers which only show legs, it’s also a bit weird, but in general I like this trend. I like not seeing the main character their faces and leaving them up to the reader’s imagination. I like making their faces up in my head once I read the book. This cover also clearly mentions the genre and were this book it about. It conveyes where this story is about with only the legs of two people. It’s obvious he is a groom and she’s the bride and it’s about marriage in some form. And probably a romance and I would guess adult from the cover, which is all spot on if you read the blurb. I like the simple use of colours, it only uses three main colours black, white and pink and I think it works. It’s a calm and simple cover, but it looks nice. My only issue with these leg covers is that they often look a bit photshopped if you look too closely. Like the bride her legs are in a slightly different direction than if she was really standing against him. And if you look closely, you notice her shoe isn’t on the floor and it seems she’s almost falling and almost goign to step on her dress. To conclude: I think it’s a ncie cover, it displays were the book is about and leaves the faces to the imagination of the reader. The legs do look a bit photoshopped if you look closer. And I think the use of only three colours really works for this cover. Have you read a book with the mail-order groom or mail-order bride plot and what did you think of it? I’ve never read a book like this but have seen them around, not too sure I’d be on board with this concept though. It sounds pretty dangerous to me. I agree it’s not very realistic and in real life I would say it’s dangerous as well, but I think it does happen. Maybe not as quick as in this book, but some people do marry so the other can stay in a country. I think this book will put a comical spin on it though. oh ya, it happens all the time here. I know they made a silly television show about it that was running for awhile. I think I’d like to read this book though cause it does sound funny and it is a gender flip flop to the normal situation. Yes that’s what caught my attenion with this book how the genders are reversed from the normal situation. It is crazy that things like that happen in real life, but in a book it sounds fun. There is something I think about NOT seeing the characters faces that makes it more interesting. But sometimes, GAH, I just want to see their faces, you know? When you do see their faces, do you picture them like that? Or do you still picture them the way your mind has conjured them up to look? Also, I see you’re doing the Historical Romance Reading Challenge. *Fist pumps the air for you* I’m a total fail at this challenge at the moment because I don’t know much about the genre. It adds to the mystery if you don’t see their faces. I also get that feeling of still wanting to see their faces as well, while on the other hand I also like that we don’t. When there is a face on the cover, my mind usually uses that as starting point, but still twists it a bit. Or sometimes I imagine the character completely different even though there is a face on the cover. Or for exmaple with Harry Potter I have my own image that get’s overriden by the movie, which is something I hate and why I sometimes don’t want to see a movie as I want to keep my own image of the characters and setting. I joined the historical romance challenge to force myself to rea dmore in this genre, I have read two historical romances so far which is already a win in my opinion as it’s mroe than last year. I want to get to know this genre more, but it’s hard to know where to start. Although I have enjoyed the two books in this genre I read so far. It’s been a while since I read a mail order bride story. The last one I read was set in the old west and they had a hard time of it. But I like this cover. I don’t think I’ve read a lot if any books with this topic. I remember I saw a mail-orde rbride book set in the wild west on someone’s blog awhile ago, I wonder if it’s the same book. I think it’s a fun cover as well :). Haha, that’s such a quirky cover, although quite predictable for a romance story like this one. I’m pretty interested in reading this, although I am a bit iffy about the title… mostly because “Mail Order Brides” are such a sensitive issue here in South East Asia. Most romance books are quite predictable and I think most people know where this one is going from reading the blurb,but it still sounds alike a fun read. I think the mail-order topic is a senstive issue indeed, but from the blurb I get the feeling the author uses it in a lighthearted way in her book and more for a fun romance. I love a good romance story and this one has a ncie cover indeed! Just added this to my TBR, thanks! 🙂 I hadn’t heard of this one before, the concept is very realistic, I agree with the people above. I am intrigued enough to what to read this novel though, pretty cover too. It’s a realistic concept indeed and it sounds fun how the main character falls in love with her mail-order groom. Yeah it seems the general consensus is that it’s a great cover that attracts the attention of reader :). Also that’s good to know he isn’t a total stranger.